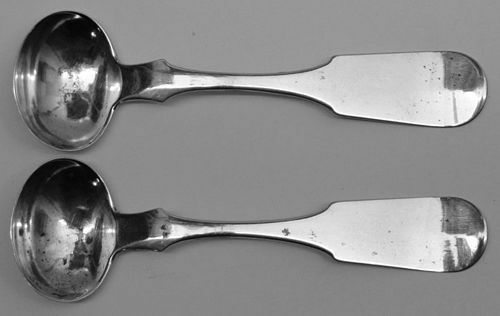 Offered is a pair of American coin silver master salt spoons by little-known Norristown, PA silversmith and retailer Washington T. Koplin. These spoons measure about 3 1/2 inches in length on average and weigh a total of 12 grams. The maker's mark is legible on each, and there are no monograms. Condition on one of the spoons is good, with modest wear but no splits or repairs. The other spoon has a tiny hole in the bowl. All in all an interesting example of silver from the Norristown area! Washington T. Koplin was born October 2, 1827 and died March 21, 1879. He was a celebrated singer and chorister, and was known more for that activity than for his work involving silver.